Whether you are spending your days lounging by the pool, catching waves at the beach or soaking up the sun in your own backyard, I hope you are enjoying every minute of summer. The same goes for your summer nights, whether they are spent barbecuing with friends, listening to music at your local park or (as in my case) entertaining friends and relaxing by the fire pit. At Interior Excellence, we can’t help but notice and share this summer’s design trends. In our industry, we spend all year renovating and designing homes, but I have to say…. “there is something special about summer”….. Kitchen renovations have us smiling, as stainless steel appliances (which we had all come to love) give way to grey appliances (we have also installed our share of other dark tones). Marble and granite counter tops are making room for quartz counter-tops (available in all styles and colors). Home owners marvel at the new kitchen islands. They no longer provide only counter space, they now provide (much needed) storage space. Your options are endless. And, ceramic tile floors are having their moment, and are available in beautiful designs and styles. Current bathroom trends include open, spa like floor plans, and unique stand alone tubs. As you redesign your bathroom, think luxury and elegance. Close your eyes, breathe and consider bringing the outside, in. Reminiscent of summer days spent at the ocean, we are seeing cool white bathrooms with accent colors such as blues (think “ocean”) and greens (think “trees blowing in the breeze”). Today’s summer decorating trends remind of us of time spent outdoors. We are seeing light weight fabrics and window treatments, which make us feel as though we are relaxing on an island. We are seeing walls and rugs in soft colors (light gray, whites and creamy tones) with pops of summer colors as accents for pillows, candles, accessories (think: golds, oranges, aqua blues and tropical greens). We are seeing porches and sun rooms with minimal furniture (hanging chairs, wicker tables, textured rugs and green plants), all that leaving us with the hope that summer will linger, endlessly. The greatest news is, we still have most of the summer ahead of us! More time to relax, vacation, and soak up the sun. And, for those of us who like to plan, (even while relaxing), there is no time like the present. Let’s meet and discuss your plans for upcoming renovations. Interior Excellence is an interior renovations company that can make your desires into a reality. 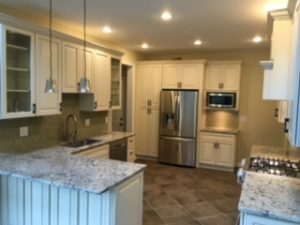 We specialize in kitchen, bathroom and basement renovations. We are a One Stop Design Shop, and can meet all of your design and renovation needs. You only deal with us, and we handle permits, architectural plans, plumbing, electrical, flooring and design needs. We take you shopping, provide you with 30 plus years of design experience and pass our designer discounts on to you. We provide you with referrals, and encourage you to call them, as we pride ourselves on happy customers.